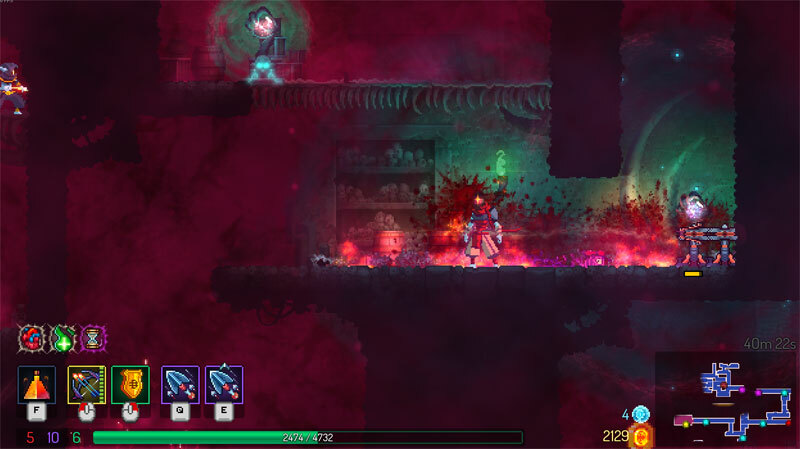 Dead Cells is an addictive mash-up of three separate gaming genres. At its core, it's a side-scrolling platformer with monsters to kill and challenging boss fights like the Castlevania series. As a Rogue-like game, death is permanent and kicks you back to the beginning of the game with reset stats and basic starter equipment. Some earned abilities are permanent and persist beyond death, allowing you to explore old levels in new ways, evoking comparisons to the Metroid series and reducing the general level of frustration. This feedback cycle of explore, grow powerful, and die is perfectly implemented, with interesting loot drops, forgiving but tight controls, and randomly generated levels that contain enough common features so that you learn what to expect, if not exactly how it will come at you. You have to reach the end of levels to save your progress towards permanent upgrades, creating a nice risk-reward mechanism for how long you choose to explore a dangerous level for better loot, and how much you might lose if you die before you exit. As you gain permanent upgrades (like the ability to grow a climbing vine, stick to walls, or smash through floors), alternate paths through the world open up into completely optional levels just as you start to get tired of the original ones. There's always just enough freshness to keep you exploring, and no single run feels particularly grindy. For example, killing the first boss might seem impossible on your first few runs, but gradual permanent upgrades will eventually make him managable. Immediately afterwards, you'll unlock new options that make him much easier to beat on subsequent runs. It's challenging without feeling tedious. I'm not great at platformer games, but there are enough different ways to develop the character (melee, ranged, trap-based, elemental magic) that I can find ways to play my strengths. And since the build essentially resets on death, there's plenty of incentive and opportunity to experiment with builds that I wouldn't normally consider. The music and sound design is well done. Graphically, I'm not a huge fan of the 16-bit style, but the animations are fluid enough to minimize my annoyance. I purchased the game on PC and have rare issues using double jump properly with mouse and keyboard -- a console purchase or a game controller might be more comfortable. Regardless of the platform, this is a nicely-polished $20 package with plenty of replayability and content. I've already put about 20 hours of play in and have not grown tired of it.